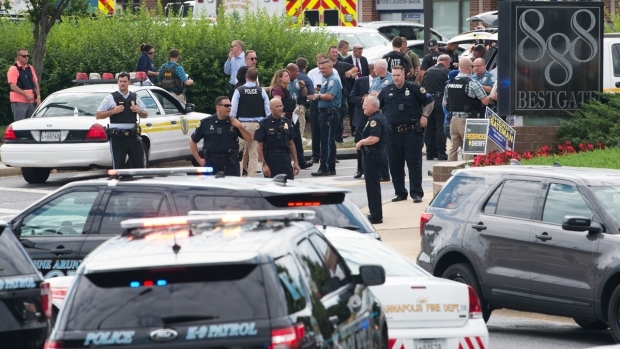 The man suspected of killing five people and injuring several others at a Maryland newspaper in a "targeted attack" had a "vendetta" against the paper and had made threats on social media, officials say. 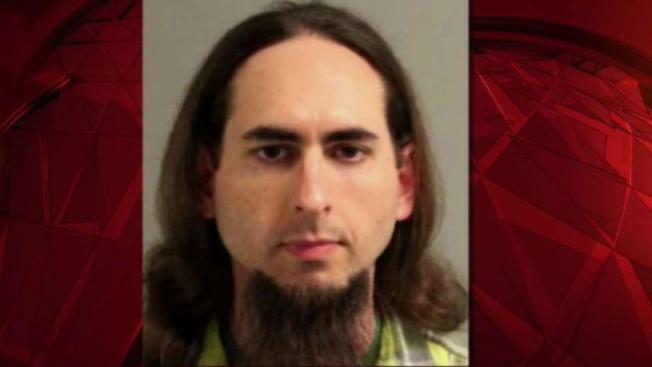 Jarrod Ramos, 38, is accused of opening fire at the Capital Gazette newspaper building in Annapolis, Maryland, Thursday. He is charged with five counts of first-degree murder, according to court documents. A judge ordered him to be held without bail Friday after determining he is a flight risk and danger to the community. Authorities said the suspect was armed with smoke grenades and a pump-action shotgun, which police said was purchased legally about a year ago. 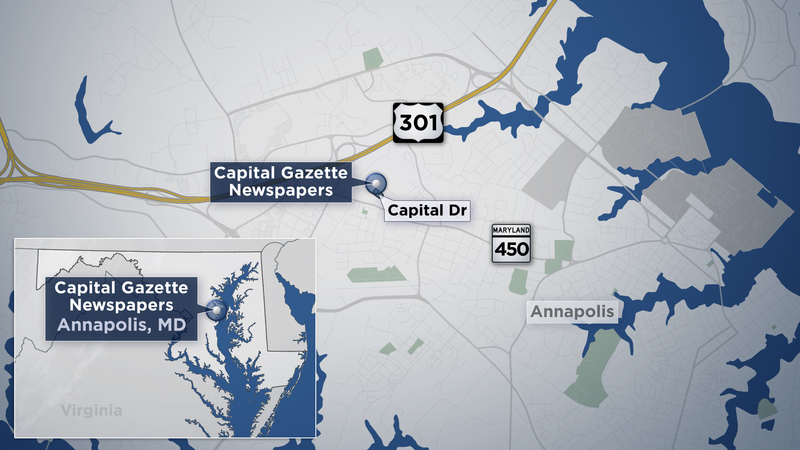 "This individual had some type of vendetta against the Capital newspaper, and they were specifically targeted," Lt. Ryan Frashure said in a briefing Thursday night. 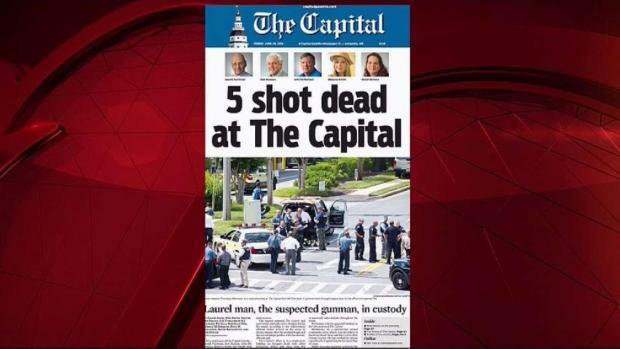 The grieving and the reporting sort of jumbled together for staffers at The Capital Gazette after a fatal shooting at the newspaper, but they were determined to put out the next day's edition. At a press conference Friday, police chief Timothy Altomare called the massacre a "targeted attack," saying, "the fella was there to kill as many people as he could get." It wasn't clear whether Ramos had an attorney who could answer to the charges against him. Ramos sued the Capital for defamation in 2012 after the paper published an article in 2011 about criminal harassment to which Ramos pleaded guilty. In what a judge called "rather bizarre" behavior, Ramos used Facebook to contact a woman he knew in high school and then sent her threatening emails, called her vulgar names and told her to kill herself, court documents and the article say. "If you're on Facebook, you've probably gotten a friend request or message from an old high school classmate you didn't quite remember," the article begins. "For one woman, that experience turned into a yearlong nightmare." The article says Ramos contacted the woman and thanked her for being kind to him in high school. She wrote back, and they emailed. She suggested he see a counselor. Then, he lashed out at her. She "lived in fear for her safety for months," the article says. Ramos was charged with criminal harassment in Anne Arundel County and pleaded guilty. Initially, he was sentenced to 90 days in jail. Then, a judge suspended the sentence and placed him on probation for 18 months, ordered him to undergo therapy and required that he have no contact with the woman or her family. Ramos sued the Capital for defamation but failed to prove that anything in the story was false. Court documents say a judge "probed the appellant to point out a single statement in the article that was actually false or to give a single example of how he had been harmed by the article. He could not do so." Judge Maureen M. Lamasney dismissed Ramos' claim in 2013, ruling that the article was accurate and based on public record. "They reported a matter of public interest," the court ruled. Ramos then appealed and lost. Authorities surrounded the Laurel, Maryland, home of the man suspected in the deadly shooting at the Capital Gazette in Annapolis. News4's Darcy Spencer reports. Former editor of the Capital Gazette Tom Marquardt told News4 that Ramos threatened him and a former reporter numerous times during the years Ramos pursued the defamation suit. Marquardt said they were so afraid that they reported the threats to Anne Arundel County police. But he said officers didn't believe there was enough to charge Ramos. "I thought the guy was a physical threat and the police didn't. The police didn't feel like there was enough there that they could pursue it so I'm disappointed, angry. I'm angry that this guy was still walking around and making all these tweets," Marquardt said. Altomare defended his department's actions, saying Friday on the "Today" show, "This is the greatest of free societies on earth, so conduct has to cross certain lines before we can start to take definitive actions like arrests and/or commitments." Altomare said police did investigate "verbal threats towards staff members" in 2013 and spoke with The Capital's legal counsel and several staff members, but "as a shared agreement between the investigators and the Capital management at the time, they decided not to press forward with a formal investigation because they were afraid it would exacerbate the situation." The chief added at a press conference later Friday that he did not feel his department "was negligent in any way." Marquardt said he and his staff never met Ramos in person, but felt threatened and had a newsroom meeting about Ramos. He said he was afraid of the suspect and for his own family. Ramos took to Twitter, where he routinely harassed journalists from the newspaper in scores of profanity-laced tweets. One of those tweets targeted one of the journalists killed Thursday, Rob Hiaasen. In another tweet, he discussed how he'd enjoy seeing the paper stop publishing, but "it would be nicer" to see two journalists "cease breathing." Altomare said investigators found evidence of planning at the suspect's apartment in Laurel, Maryland. However, state prosecutors declined to comment on any evidence, saying the investigation is ongoing. Online court records in Maryland show that three peace orders were taken out against Ramos — one each in 2011, 2012 and 2013. A judge can issue such protection, ordering someone to stay away from someone else and to avoid contacting them. In at least two instances, Ramos appealed the orders. It wasn't clear whom the cases involved or what the ultimate outcomes were. Then, in 2013, Ramos sued Anne Arundel County District Judge John McKenna. Online court records did not indicate the nature or result of that suit. Court records show Ramos was fired from a government IT contractor because of concerns about his "suitability.'' Ramos sued Virginia-based Enterprise Information Systems in 2014 over lost wages, District of Columbia Superior Court records show. In a letter to the company's president filed in court records, Ramos said the U.S. Bureau of Labor Statistics requested he be removed from his job. A panel of judges wrote that the prime contractor "demanded'' Ramos be fired for unspecified reasons. Ramos won $1,200 in the suit for a bonus he said EIS had denied him. EIS officials did not respond immediately Saturday to a request for comment. A U.S. Labor Department spokesman said Ramos worked on IT contracts for the labor statistics bureau from 2007 to 2014. In April, Maryland’s governor signed a “red-flag” bill into law that will allow family members or police officers to ask a judge to order someone’s firearms be removed temporarily. The law applies to all guns and goes into effect in October.